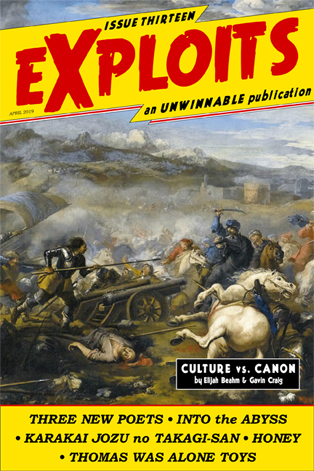 This is a reprint of the feature essay from Issue #13 of Exploits, our collaborative cultural diary in magazine form. 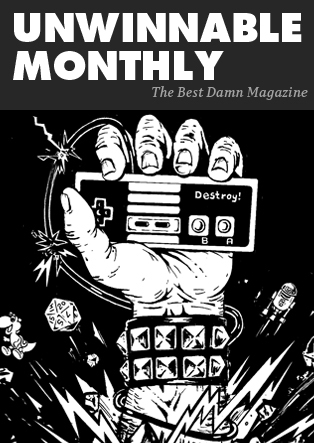 If you like what you see, grab the magazine for free this month, or subscribe to never miss an issue (note: Exploits is always free for subscribers of Unwinnable Monthly). Editor’s note: This series of letters continues a discussion that began in Exploits #5. Elijah Beahm first brought up the topic of culture and canon in “Would the Real Dark Troopers Please Stand Up?” Gavin Craig then responded to some of Elijah’s points in his piece for Unwinnable Monthly #106, “Culture is Not Canon.” They wanted to hash out their ideas more in this issue of Exploits, and I was happy to give them the space to do so! To start, yes, culture alone cannot define canon. Every creative work is decided upon by its creators, first and foremost. There’s a problem, though, when insinuating that culture doesn’t have its place in deciding what is or isn’t canon, let alone the course of a franchise. Whole works of fiction wouldn’t exist without culture guiding what was produced. Mass Effect 3 underwent a massive retcon to its controversial ending, specifically addressing fan concerns. Green Lantern’s Parallax arc, while never erased from DC canon, remains carefully tucked under a convenient rug. Half-Life: Prospekt was approved by Valve as a sequel to Half-Life: Opposing Force, despite originating as a fan effort. #CloneWarsSaved and the appearance of Grand Admiral Thrawn in Rebels were also due to cultural push. It’s why Young Justice survived and its characters have begun dripping into the mainline continuity. While IP owners have final say, they don’t come to these decisions in a vacuum. Even before the internet, Sherlock Holmes died, only for fandom to resurrect him after Sir Arthur Conan Doyle gave him the ax. Now we live in a world where culture a nd creators can engage far more directly. The lines that once divided are blurred, for better or worse. Just because one person is steering the boat, doesn’t mean they can ignore the course their audience is pointing to. If anything, it puts more weight on creators’ shoulders, because now they have to learn how to read the crowd in a whole new way. I’m not saying that every fan response is justified, or that some of the choices made because of them were for the best. Yet, we’ve also seen marvelous things come about because of fans and creators agreeing to the right heading. It’s no longer dictation from one party to the masses, but a conversation. There’s a lot to chew on here, and I think it’s useful if I try to clarify my terms. When I wrote that “culture is not canon,” I wasn’t using culture, as you seem to be, to refer to the audience as opposed to the author and/or IP holder of a creative property. I think we would agree that the ongoing life of a creative work is a complex set of interactions between the thing envisioned and shaped by its author(s) and the thing as received, imagined and re-shaped by its audience. I think that we re-create a creative work every time we engage with it and that, in the best cases, creative works exceed their authors and become not just a story we were told but a part of the stories we tell and re-tell. This ongoing process of re-shaping and re-telling beyond the strict limits of the original work is what I’m referring to as culture, and I see canon as oppositional to this process. When culture and not canon is at work, then there are multiple versions of stories like the Greek myths, with no way to determine which version is definitive and no purpose served in doing so. Robin Hood turns up in Ivanhoe. Shakespeare adapts his plots from the histories and legends available to him, and if a troupe of actors prefers that Romeo and Juliet survive, then they are free to stage a new ending as they please. If a new version of a story is compelling, it survives and is re-told, perhaps alongside the earlier versions. Most importantly, in culture, it isn’t Shakespeare who decides whether his star-crossed lovers live or die. It isn’t even the theatre troupe. It’s us. Canon, even in the instances you cite, doesn’t work like this. Fandom didn’t resurrect Sherlock Holmes. Doyle did, ten years after Holmes’ “death,” because his historical fiction wasn’t selling. Canon – an “official” set of stories based in intellectual property rights – sells us the lie that the market is the only way to participate in our stories, and that if rights holders respond to market pressures that they’re “listening” to us. Even worse, the idea of canon has convinced us that the indefinite private ownership of our stories is legitimate, and that’s the most pernicious outcome of all. I think we’re more in agreement than one might presume. I’m not defending “official” canon as it stands. Corporations aren’t poets and shouldn’t be treated as such. We also seem agreed that the community should have a say in things and that works of fiction should have lives that extend far beyond the rights holders. However, canon itself doesn’t have to be the problem; amazing works have been born from working within those confines. The problem is how it’s used and valued. My criticism of Dark Troopers that kicked this whole conversation off? I was laughing at the situation. I don’t get excited for Star Wars’ canon works anymore. Years of people’s writing, tossed aside primarily because Chewbacca died in a Legends book and Disney wanted to keep making Chewbacca toys. It’s insulting, degrading and mostly redundant given most of it is the same, Xeroxed. I hate that for months I stressed about some billionaires telling me the fiction I loved was irrelevant. It wasn’t until I stopped, and opted to join a roleplay group who also didn’t care, that I enjoyed Star Wars again. Only through the culture did I rediscover what I enjoyed in the first place. So yes, I get you. I just also can’t help but think that canon doesn’t have to be a dividing line. In comics, it’s often a measure of whatever is most mainstream, with divergences advocated across the board. Out of Into the Spider-verse’s many valuable messages, a significant one is in how fiction exists beyond the mainstream, and that new perspectives, ideas, and content are valid. Canon doesn’t have to hold us down, but instead be used as a leaping off point; fostering creativity with the possibilities, sowing the ground for the seed of culture, rather than trampling over it. I would also agree that the problem isn’t canon per se, it the way that canon is used and valued. There’s nothing wrong with, say, a Marvel Cinematic Universe – that is, a set of stories that overlap and build on each other in a roughly consistent fashion – just as there’s nothing wrong every so often with setting particular canons aside, such as in a Crisis-on-Infinite-Earths-style reboot. The problem is that too many of our stories have stopped being stories and started to function as brands. We cannot help by to be shaped by the stories we love, but we give up something when we become part of a brand, if for no other reason than that stories change when we need them to change, but brands change (or do not) at the whim of the rights holder. I think you’re exactly right that it’s good when we push against canon, I just think that we’re better off when we stop spending our energy fighting over what canon should be (and, too often, which communities’ voices do and do not matter in determining canon) and realize that canon, especially in terms of storytelling franchises, is temporary, arbitrary, and illusory. It isn’t ours, and it isn’t for us. It is, at best, a starting point, and we are better off the sooner we move on.